Foundation is just that! This class gives you the building blocks to lay a solid and safe foundation for your yoga practice. Foundation is perfect for new yogis stepping on the mat for the 1st time or those returning from a long break. It's also great for students looking to refine alignment in their practice. In this 1-hour class we will break down the alignment of basic poses, bring awareness to the breath and the role it plays to aid you in your practice. Yoga doesn't have to be serious. Bring your smile, a sense of humor, and get ready to have some fun! Let nature into your practice during a class on our beautiful, tree-lined yoga deck! Look for outdoor classes on our schedule as weather permits! This is an all-levels, all-trimesters class to support expecting mamas physically, mentally and emotionally throughout pregnancy. Find community with other moms-to-be, connection with yourself and your baby, and get a workout, too! Start your day off right by aligning with your body, breath, and intention to find the perfect balance of ease an stability both on and off the mat. 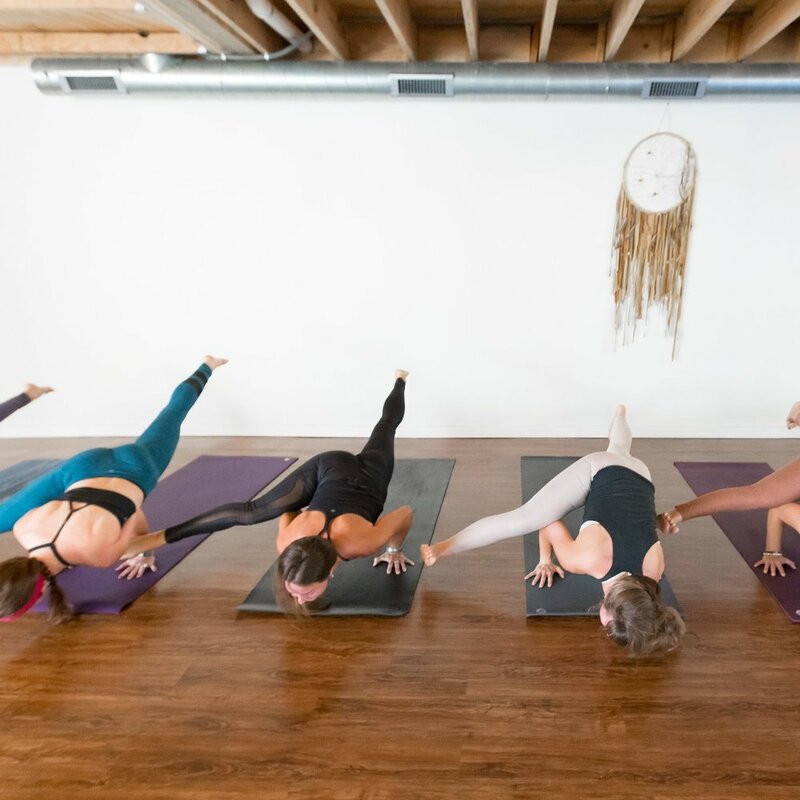 In this class we will bring awareness to imbalances hidden in the body and work to bring them into harmony through more slowly paced, deliberate movement assisted by the use of props, breathwork and meditation techniques. Expect to work hard and build up a sweat as you develop strength, flexibility, balance and concentration. Beginners and experienced yogis alike will leave with new discoveries and a sense of what it means to truly be aligned! Restore is the Yin to your yoga practice, where Vinyasa and Power are the Yang. 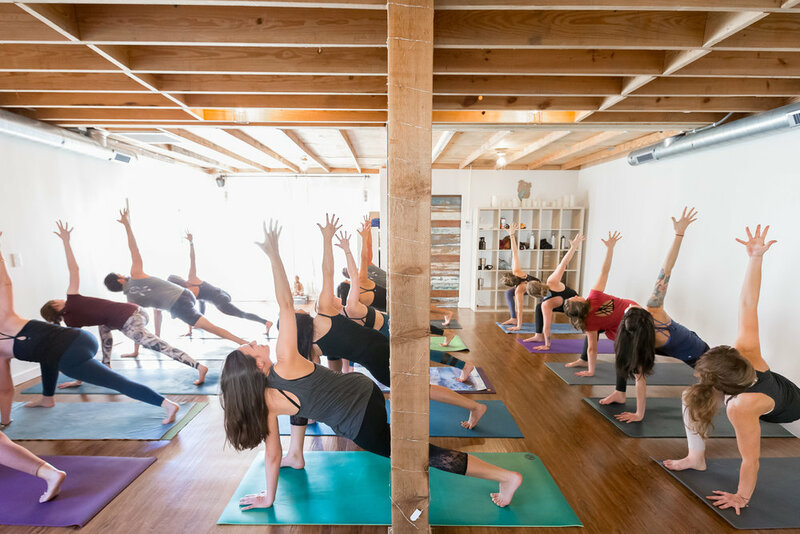 Vinyasa and Power focus more on the muscular structure; Restore brings the focus to the connective tissue, ligaments and joints of the body. This is mostly a floor-based practice, holding postures for longer periods of time and often accompanied with props. Get ready to feel like a wet spaghetti noodle when you leave the studio. Yoga Stoned- it's a thing! If Yoga, Pilates, and Boot-Camp had a baby it would be Yoga Sculpt! This class warms up and cools down with yoga, and uses high-intensity intervals (strength, plyometrics, cardio, isometric) of athletic conditioning through yoga drills with a focus on strengthening and stabilizing the core. Many of the intervals will be directly linked to advanced postures so you're able to take your sculpted muscles and apply them in a way that makes sense on the mat. Get ready to sweat it out as you sculpt lean muscle mass! Yoga for the youngins! 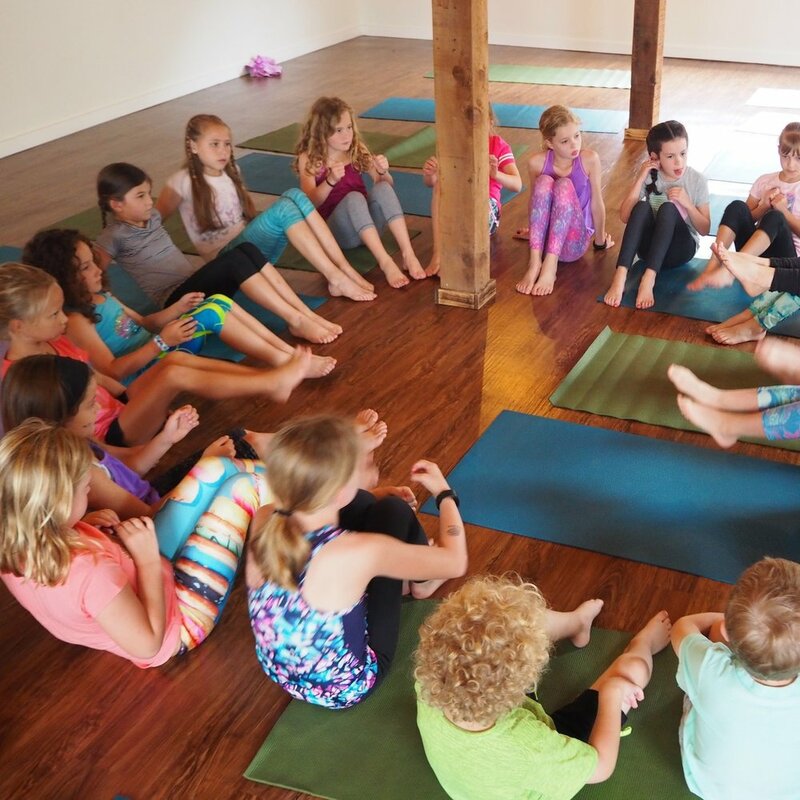 This class is a mix of yoga, yoga-inspired games, arts and crafts, meditation and breath techniques that keep ‘em moving, thinking and playing! Ages 4-12 years (must be potty-trained).